On holiday weekends and Thursday nights beginning Memorial Day weekend through Labor Day weekend, Harborwalk Village honors the military with song, dance and a beautiful fireworks show. 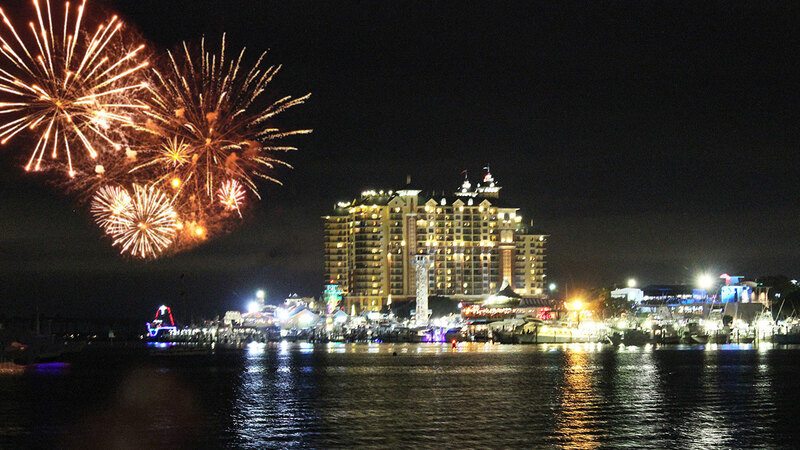 Our boat departs the harbor at 8:30 pm and the fireworks begin at 9:00 pm. The Captain will position the boat in the pass so you can enjoy the firework show. Everyone should experience seeing fireworks while you are on the water. Our fireworks cruise is extremely popular and seating is limited; advance reservations are highly recommended. Book your Fireworks Cruise today! The entire team at Destin Snorkel prides themselves in customer service. We’ll take you out on the beautiful waters surrounding Destin and the Emerald Coast for a safe and enjoyable cruise. Book your trip with Destin Snorkel today! We’ll take you out on the beautiful waters surrounding Destin and the Emerald Coast for a safe and enjoyable tour.